Florida Sen. Marco Rubio bristled at last week's Republican debate in Boulder, Colorado when he was asked by CNBC anchor Carl Quintanilla, "Now, you're skipping more votes than any senator to run for president. Why not slow down, get a few more things done first, or at least finish what you start?" "That's an interesting question," Rubio responded. "That's exactly what the Republican establishment said, too. Why don't you wait in line?" Rubio may have been thinking of his 2010 Senate run, when he stunned political observers by topping a popular sitting governor, Charlie Crist, who had just two years prior been mentioned as a potential vice presidential candidate for then-Republican nominee, Arizona Sen. John McCain. "Wait for what?" Rubio went on. "This country is running out of time." Rubio has always operated as a man running out of time, even as he runs a slow and steady campaign in which his poll numbers are rising, putting him in the top tier. His uncompromising ambition and impatience didn't start with that Senate run, though. It was evident in his twenties and could be seen in his approach to legislating as speaker of the Florida house. His mixed record there was defined by sharp clashes with then-Governor Crist - who was also, at the time, a fellow Republican (Crist is now a Democrat). Who is presidential candidate Marco Rubio? "Marco would always fight and fight very, very hard for a conservative outcome," said Rick Wilson, a Republican consultant who watched Rubio's rise up close in Tallahassee. Compromise then was practically anathema to Rubio. He wanted to pass bills -- lots of them -- but not from the middle. But the business of legislating more often than not required compromise, even in a state as reliably conservative as Florida. "I think that he's a person that believes that good, solid conservative policy that's well thought out and well crafted can have very broad appeal," Wilson said. "Let's be honest, in the state of Florida, the Democrats are an afterthought in legislative process." This is true - Republicans have controlled both the Senate and the House in Florida for decades. Rubio became the first Cuban-American speaker of the Florida House in 2006, marking a shift in power in Florida politics. There had not been a speaker that hailed from Miami-Dade County since the early 1970's. In his book "American Son," Rubio acknowledged that he represented a district unpopular among colleagues because it was in the southern part of Florida, which was more populated and therefore received a larger share of the state's budget. When Rubio became speaker in 2006, there was discontent for Republicans nationwide. Democrats had won control of both houses of Congress for the first time in 12 years. Opposition to the war in Iraq was high. In Rubio's own legislature, Democrats gained seven seats, the first time the state party had gained in more than 20 years. But that didn't stop Rubio from relentlessly pursuing a conservative agenda. In the lead-up to becoming one of the most high-profile Hispanic lawmakers in the country, Rubio traveled the state hosting "idea raisers." For a year, legislators and citizens from all over the political spectrum were invited to submit ideas for the upcoming agenda. The best ideas were to be released in a book by Rubio called "100 Innovative Ideas for Florida's Future." "It was one of those things that he did to set a tone and set a stage for moving policy forward," Wilson said. Although Rubio claimed he would look beyond politics for the best ideas, the book was funded by the state Republican party, and it fell to a committee of Republicans to winnow the thousands of submitted innovative ideas into the 100 that would be published. "I was not a fan of it," says Dan Gelber, the Democratic minority leader at the time. "He might've had a website but we would put ideas in there, of course, knowing that they wouldn't get them into the book. It was just sort of - I felt - a repacking of a lot of the Republican talking points." Some of the ideas seemed to be on the fringe, like instituting a literacy requirement for prison inmates to be released, or fining citizens who don't vote. But many of the submissions involved policy suggestions on education, property taxes and public health. To this day, as he campaigns, Rubio often claims that the majority of the ideas in the book became law, citing this as an example of his legislative achievements. According to a PolitiFact analysis, though, only a quarter of the 100 ideas were fully enacted. While Rubio touted those policy achievements, it was his battles with then-Gov. Crist that defined his tenure as speaker. "I had never had a very good relationship with Charlie Crist," Rubio wrote in his book. "He, and especially his staff, viewed me suspiciously from the outset." They clashed on everything from climate change to gambling, foreshadowing the acrimonious U.S. Senate race that would further propel Rubio's rise. The clashes came in spite of Crist's high approval ratings as governor. Rubio was an unknown but staunch conservative, while Crist was a well-known moderate. "Marco wasn't intimidated by that," Wilson said. "He didn't wake up every morning and go, 'Oh, well, I can't go up against Charlie Crist because his popularity is so high.' In fact, Marco took a lot of slings and arrows because of the fact that he was going to stick to his conservative principles." Rubio became the face of a drawn-out property tax and property insurance debate as speaker, two issues that immediately confronted the legislature during his tenure. Multiple special sessions were convened. Property insurance premiums skyrocketed before Crist took office, owing to a number of hurricanes that slammed Florida. Property tax collections from 2000 to 2007 had also shot up -- 178 percent in Miami-Dade County, for example, according to the Miami Herald. Crist killed Rubio's property tax proposal, which called for a deep cut in property taxes in exchange for a higher sales tax. Rubio was lukewarm about Crist's proposal, called Amendment I, which increased the homestead exemption and allowed homeowners to put tax savings towards a new home. The outcome deeply disappointed Rubio. In a 2009 interview with National Review, Rubio said no one remembers Amendment I "because it didn't do anything." "I knew the bill wasn't good enough," Rubio wrote in 2012. "I knew it would be hard to bring the issue up if we passed it. But I also knew we had gone as far as we could. We had done our best and fallen short. I accepted the hard reality of our situation, and let the bill pass." "There was literally no way to beat it at that point legislatively," Wilson said. In the two years that Crist and Rubio worked together on state budgets, Rubio proposed budgets that would spend less than Crist's proposals. In year one, Rubio's House budget was only slightly less: Rubio wanted $70.3 billion, while Crist wanted $70.8 billion. In year two, the differences were more stark. Crist proposed $70 billion, while Rubio advocated for one closer to $65 billion. Crist relented, again, in the midst of a recession, and the budget passed closer to Rubio's at $66 billion. Their sharpest clash was over gambling. In order to raise revenue, Crist reached an agreement with the Seminole Indians to expand casino gambling, while paying state fees. Rubio filed a lawsuit claiming that this agreement could only be reached by the legislature, and not unilaterally by the governor. 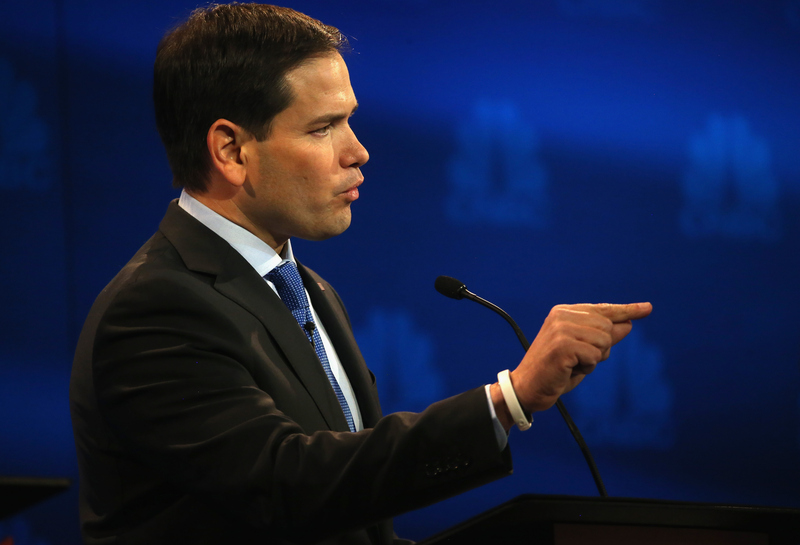 "This deal was done in secret," Rubio complained in a radio interview at the time. "The public never had a chance to have any input, and obviously the legislature didn't either." The Florida Supreme Court agreed with Rubio and blocked the measure. The fights with Crist forced Rubio to accept that he couldn't win all his fights, no matter how much of a bitter pill it was to swallow. It showed Florida that sometimes Rubio felt it was better to pass an imperfect bill than pass nothing at all. "Marco wants to move the ball to the goal line," Wilson says. "What I mean by that is it's more important to actually achieve the conservative accomplishment than it is to go out on the Senate floor to talk about it. There are too many people in D.C. today who believe that the speech they gave or the filibuster they pretended to have is the accomplishment. He's a serious person who wants to accomplish serious things."